Not two operators you normally see in the same sentence, but both have been source of great discussion on the blog this week. In my Ollie post on Wednesday there was much debate as to who the Olympians new to Manchester actually belonged to. My research suggested Greater Manchester Buses South, whereas others believed it to be Stagecoach Manchester, who took over Greater Manchester Buses South in 1994. So I am grateful to the Olympian Oracle, Robert Appleton, who has been in touch this evening to clarify everything. First of all he managed to find in his what I assume is a huge archive of old photos and slides a picture of one of the Canterbury Olympians in her early Manchester days. Here is 16760, originally 760, R760 DRJ now my header pic seen in March 1999 at Manchester Picadilly Gardens. Secondly my information saying the Olympians were new to Greater Manchester Buses South was entirely correct. Those who said nay lad they were new to Stagecoach Manchester are also entirely correct. 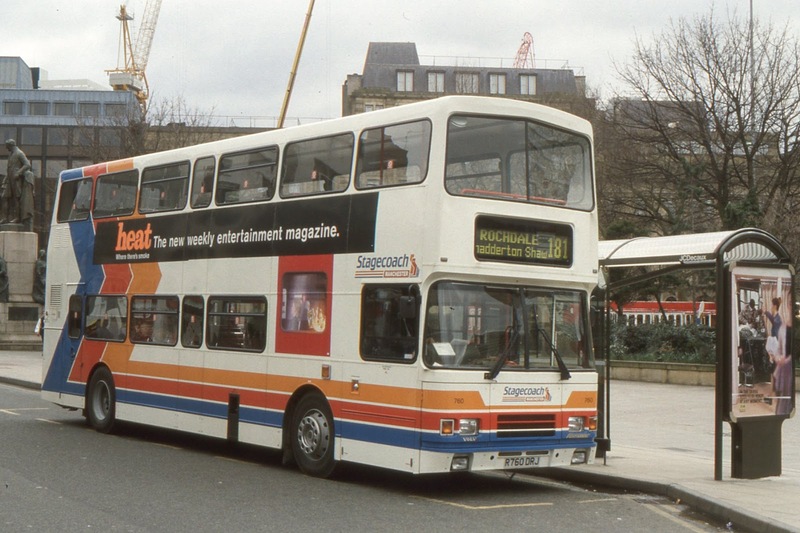 When Stagecoach took over Greater Manchester Buses South they kept the business name, and used Stagecoach Manchester as the trading name. This situation still exists, as can be seen from the most recent operating licence, which Robert has kindly sent me from the VOSA website. I hope this clears everything up and everyone's honour remains intact. Many thanks again, Robert for your invaluable help. Yesterday morning, showing devotion way beyond the call of duty, I set my alarm to catch the early morning breakfast show on Radio Suffolk. I had been advised by the presenter, Luke Deal, that an interview with Viv Carter would be played at 0720. So huddled under my duvet I listened in to see why Viv had decided to sell up to Ipswich Buses. Viv insisted there was no other reason to sell up bar the fact he was getting old and it was time to call it a day. Since they had had such a close relationship with Ipswich Buses over the years they seemed the obvious purchaser and so it happened. Viv also revealed that the Carters name and livery will continue and that the operations will be run as a separate entity in house, if that's not an oxymoron, so don't expect to see IB liveried buses on the 93 just yet. He also confirmed that he would still be running the wedding/heriitage fleet. Now I know what you are all thinking. If there was any big plan regarding the sale it wouldn't be revealed, just as much as if it was maintenance debts that made IB the obvious buyer. So as I expected we aren't much the wiser, but full marks to Luke Deal for trying to squeeze information out of Viv. I would expect Carters services to be better marketed now IB have control though. I got the distinct impression Viv was not a fan of all things computerised! Finally on a sad note Ipswich Bus Blog broke the news last week that Soames & Sons (Forget Me Not Travel) of Otley are to cease trading in July, presumably at the end of the school year. A buyer has been sought for the firm and not found so another independent is going to disappear from the local scene. It will be interesting to see who picks up all the school work Soames carry out at present. I imagine a company not a million miles from me will have ears pricked up! With thanks to Geoffrey Chaucer for help with the post title here is what happened in Canterbury on Wednesday that didn't involve Olympians. As explained in the Ollie post Canterbury is dominated by Stagecoach South East - note NOT East Kent as it used to be as the network now includes the Hastings and Eastbourne operations too. This means the area covered is huge, stretching around the coast from Faversham in North Kent right round to Eastbourne in East Sussex. Canterbury, Ashford Tunbridge Wells, Tenterden and Heathfield are towns within the SSE area. Having lived in East Kent for 5 years I have always been a quiet fan of Stagecoach and the way they encourage bus use, but I'm saving that for a separate post coming soon. You can get anywhere from Canterbury, and services are regular. The most promoted route is the Gold service from Canterbury to Folkestone and Hythe, terminating at the Romney, Hythe & Dymchurch Railway station. A very clever route as there is no direct train from Canterbury to Folkestone. 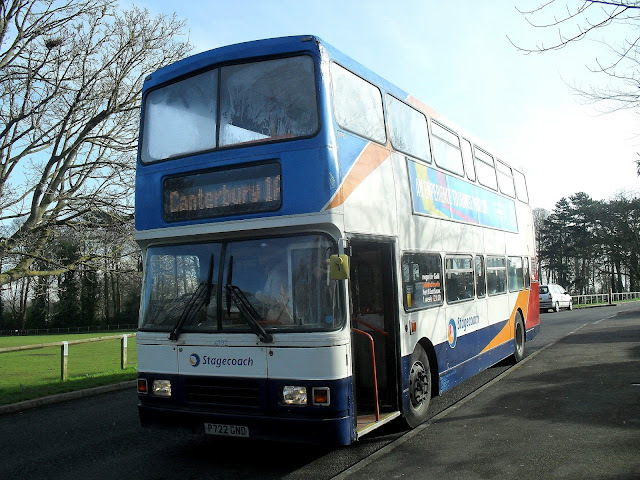 The 16 runs every 15 mins using Scania E400's which are a common sight in Canterbury. I must point out again that the sun played havoc with photography all day so apologies for the dubious quality of some of the pics. Stagecoach also operate the Canterbury Park & Ride and it must be said the buses always looked full. The services are operated using a combinatioon of ADL E400's and E300's. Scania E400 GN13HJE in familiar livery passing a much better bus! It may look like Norwich P&R from the front but thankfully the side view does reveal some differences. Finally from Stagecoach a bus I spent ages trying to get a decent pic of, and never really succeeded. I could see it was a variation of the Stagecoach livery and looked a little like First Excel livery. It turns out that ALX400 Trident 17628 W628 RND is another immigrant from Manchester, and is still dressed in basic Magic Bus livery. 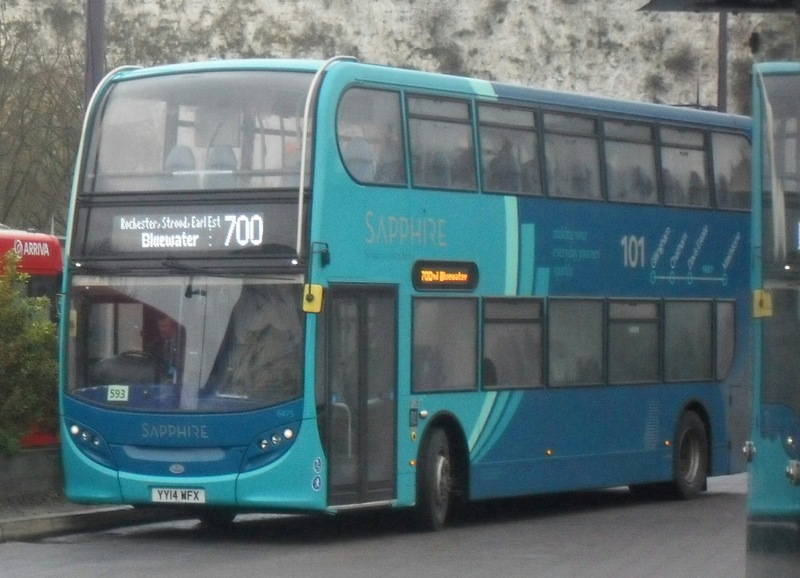 As mentioned in the Ollie post a large fleet of new buses is on their way to Stagecoach South East and I'm hoping to get regular updates and pics of them, as well as road testing them when they enter service. There was only one noteworthy vehicle I saw operating a bus service that wasn't Stagecoach. A rather striking Scania Omnicity was loitering with intent with what I presumed was a cherished registration of FH51 LTX. But no - it appears that this is the only 51 reg Omnicity ever registered, and thus quite likely the oldest. New to Nottingham City Transport in 2002 it is now with Poynters Coaches of Wye, it was operating the 620 between Canterbury and Waltham. I'd recommend a visit to Canterbury to anyone but do beware of the sun. The bus station is completely the wrong way round for decent photography so choose a cloudy day! I'm back in Suffolk for a bit now and it's time to catch up on what's going on. First of all an update on Ipswich Park & Ride, which created the best comment stream yet on the blog. It was fantastic to see so many people having their say so thanks for that - a bit boring if it's hard facts all the time, so maybe a bit of speculation isn't bad from time to time. Anyway local media have reported that Ipswich P&R is going to have a re-launch later this year in an effort to reduce the subsidies involved but Suffolk County Council want the car parks to remain open. Putting together various snippets I've heard it wouldn't surprise me one bit if Martlesham P&R becomes a mini hub, served by service buses, with an enhanced 66 being the only service into town, wth rural services terminating and starting from Martlesham. Again this is only my guesswork but let's see where we are this time next year. Good news for the people of Aldeburgh, Leiston and Saxmundham - there are timetable changes coming to the 64/65. Bad news is the changes are minimal and are of no improvement whatsoever to connections in the area. In fact my 4 times a week 196 that gets into Saxmundham 15 mins after the 64 to Ipswich has gone will now get in 5 mins after, making it even more frustrating. Trains are still not being connected with. I'm told the reason the changes I proposed last year have not been implemented yet is because of various arguments between communities along the route who all want the best connections, and uncertainty over the aforementioned Martlesham corridor. Don't understand those arguments as right now the 64/65 manages spectacularly to connect with naff all anywhere on the route so anything would be better than nothing. When it was announced Anglian had lost the 60J/68 tender it was understood that while the 68 was to be re-tendered - Ambassador will be taking it over - the 60J had bitten the dust and was not being re-tendered. 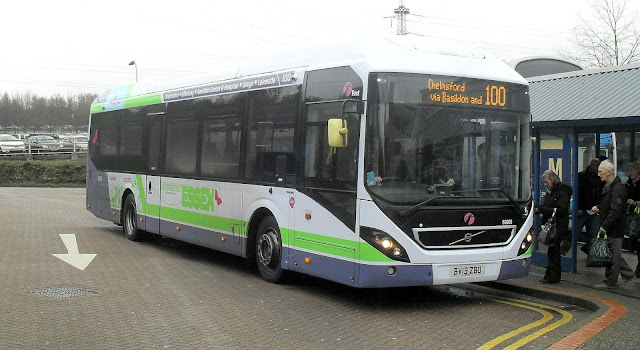 However yesterday on VOSA it was revealed that Suffolk Norse are going to operate a new service 108 along the 60J route between Lowestoft and JPH. What's more there is a 33% increase in journeys, going up to 4 from 3 each way a day. It has been suggested 60 seater sardine cans will be used (as on the 107), but I expect more likely 14 seater minibuses which already operate a route in Lowestoft (can't remember which one!). The loadings do not justify a big bus, and the route is very tricky for a bus that size too. Speaking of connections Anglian's ridiculous new timetables came into operation this week, including a 45+ min wait at Southwold if you want to interchange between the 88A and 61. The weather forecast for the next few days is for a strong easterly/northeasterly wind with a high wind chill factor. Thanks Anglian, much appreciated. Perhaps your management would like to try out that connection to see what you have sentenced your dumped on passengers to. Is it any wonder, Smurf, that businesses don't approach operators with innovative ideas when ineptitude such as that is on display? Anticipation is high in Norwich for the arrival of the shockingly pink Wright Streetwrecks to arrive. To my knowledge I'm the only blogger in the area to actually travel on one (apologies if I've missed anything) so it will be interesting to see what others think. My advice is to judge them after 3 months and see if they still feel new then. I confess I don't know the Pink Line that well but I'm going to suffer a President over the next week or so to see what the Streetwrecks will have to cope with. And on the subject of new buses I took the opportunity on the way home yesterday to try another E200MMC. Some have been delivered to Arriva Kent Thameside to operate the B13 on behalf of TfL which runs between Bexleyheath and New Eltham in South East London. I took a trip for the one and only time on the route as it is one of those mind numbingly boriing routes round as many residential raods as possible, taking half hour to do a trip that other routes do in 10 - think the 2 in Gorleston multiplied by 5! I remember the B13 being operated by Bexleybus Optare Metroriders in the late 80's and if anyone can work out what ENR stands for in the fleet number ENR6 then can you enlighten me as I haven't a Scooby! I think (haven't reseached) that this was a shorter version than the First MMC I travelled on in Scotland last year, it felt it.This one didn't seem as solid and certainly had a noisier interior, although that could be fewer seats and more plastic driver protection being London not to mention the appalling side roads on the route. However the engine tone is so much quieter and pleasant, the brakes are better, and the general ride firmer and more reassuring. It is a whole lot better than the old E200 and light years better than the Streetlites - went on a 15 reg Fasttrack Streetlite to Bluewater yesterday and it rattled like a couple of copulating skeletons. Over the weekend I'll post the second part of my Canterbury visit, including a very familar livery, and remember I'm meant to cover trains too with a rail post. I needed some therapy today, and what better therapy than spending the day riding Olympians. Obviously not in East Anglia as they have all but vanished but down in East Kent there are plenty still plying their trade on some very picturesque routes, and so I caught the train down to Canterbury to see what I could find. I had been advised which routes the Olympians were to be found so of course the first bus on that route I saw was an ALX400. However there were a few parked up and it wasn't long before one of the old warhorses showed up in service on the 1A to Chartham, a village a few miles outside Canterbury. A round trip took an hour and it seemed rude not take advantage of the opportunity. 16792 P722 GND was new to Greater Manchester before Stagecoach took over, and was part of the Magic Bus fleet before going on loan to Hastings and finally ending up in Canterbury. I don't really need to say the ride was great, no rattles, comfy old bench seats and smooth, but it was (and yes it's an Alexander body), even if the driver reckoned it was the only Olympian he didn't like! On return to Canterbury I saw another Olympian was on one of the routes I'd been advised were a regular haunt so jumped on the 14 to Sandwich, which is a seriously old town. Some of the streets the buses have to negotiate are ridiculously tight and I have a feeling a few of my driver friends in East Anglia would suffer extreme SBT (think Fergie) if they saw the narrowness of the lanes with 13th century buildings hugging the kerb either side! This time I had 16501 R501 UWL. New to Thames Transit she has also seen service in Manchester before coming down to Kent in 2012, initially at Herne Bay but now at Canterbury. Another gem and the journey reminded me why Kent is regarded as the Garden of England. Shame so mich of Kent is a compost heap though! I was meant to meet my pal in Canterbury, who has just taken up a senior management position at Stagecoach, but unfortunately a meetiing with the union overran and he was forced to cancel. However it gives me the perfect excuse to go back down there, especially as Stagecoach South East are soon to take delivery of the first combination of a particular body/chassis in the country in the next few weeks and I've been promised all the info/pics etc and of course I'll have to road test them. I'm not giving anything away yet but I'm looking forward immensely to it. Anyway after wandering around Canterbury for a bit - really lovely City - and taking many other pics of which more in a second post over the weekend, I witnessed an Olympian exodus all out of service clearly heading for school work. I thought that was it when yet another Ollie came in on the 89 to the old mining village of Aylesham. I wasn't sure if it was coming back but Aylesham has a station so no worries. As it happens it did come back, and this Ollie was probably the best of the three I went on today. 16760 R760 DRJ was another bus new to Manchester, and has seen service at Eastbourne and Folkestone before moving to its current home in Dover. I must thank the extremely friendly driver who stopped especially for me to take this pic - the sun had been a nightmare all day photography wise and this was undoubtedly my pic of the day. Aylesham has changed since I was last there 30 years ago but again some of the roads the bus had to get down looked like cul-de-sacs! There are a couple more Olympians native to the South East I want to go on before they are retired but today was just what the doctor ordered. Great buses, great scenery, friendly drivers. Can't get better than that. As a side note I was researching the train fare to Canterbury on the Southeastern website last night. Now I know train companies have been criticised for not showing all alternatives but the concept can be taken a little far. The website told me I could catch a train at 0822, take 59 mins to get to Canterbury for a return fare of £15. Not bad these days. However it also told me I could get the same 0822 train, travel via Ebbsfleet and Ashford on the HighSpeed network, get to Canterbury 30 mins later than the first option and pay the princely sum of £38.40. Well thanks for the choice, Southeastern but I decided to pass! As a second side note with regard to Ipswich P&R I have been asked to point out that it is Suffolk County Council who want to close it, not Ipswich Borough Council who want to keep it open. In which case why don't IBC take it over? Could it be its not making money which is why SCC want to close it but IBC are making out of the tender so want it to stay open? Would that be a cynical view? Of course if IBC finally sorted the ridiculous traffic flow problems in Ipswich (not to mention the huge amount of empty shops, finished the Waterfront and made Ipswich a more attractive place to shop) then more people might use the P&R to get there! Revamping Tower Ramparts and calling it a fancy name won't be enough! One day the world will end. Trouble is no one knows when. It could be tomorrow, it could be billions of years away. The same applies to Ipswich Park & Ride. It was officially announced on Saturday that it will close. However no date was set for closure. A date has been banded about whch is quite surprising at first glance. Everyone knows that the busiest time for P&Rs is the run up to Christmas so of course the suggested date for closure is October. Actually since a Council is involved it's not really that surprising. Ipswich Borough Council see maintaining the P&R sites as too expensive and so want to clog up an already clogged up town even more! As soon as I know more I'll publish it. So with IBC announcing the closure of the P&R it makes the news Clive broke on Ipswich Bus Blog on Friday all the more baffling. Ipswich Buses have bought out the bus operations of Carters Coaches and no one has the faintest idea why. It was announced to Ipswich Buses staff on Saturday and the driver I was talking to today (really nice chap) said no one had the slightest inkling it was going on. He also said it was more surprising as apparently IB want to convert to a single deck only fleet and bar the VDL Evolution Carters have a fleet of deckers! So what is going on there? Why do IB suddenly want a route to Essex? In the same bracket as one day the world will end is one day IB will be sold. It's inevitible. I've recently had debates with the good and the great in the local bus world as to who would want to buy IB. First probably wouldn't be allowed by the monopolies people. Go-Ahead have seriously fallen out of love wiith this area thank God. 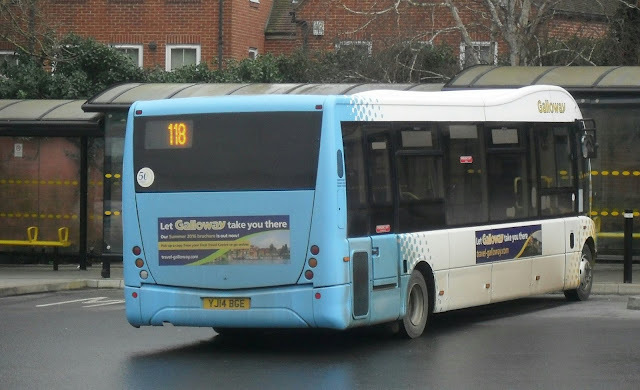 I know Arriva, despite having Colchester Transport, are not interested in going any further north which leaves Stagecoach, whose nearest operations to Ipswich ar Cambridge and Kings Lynn. 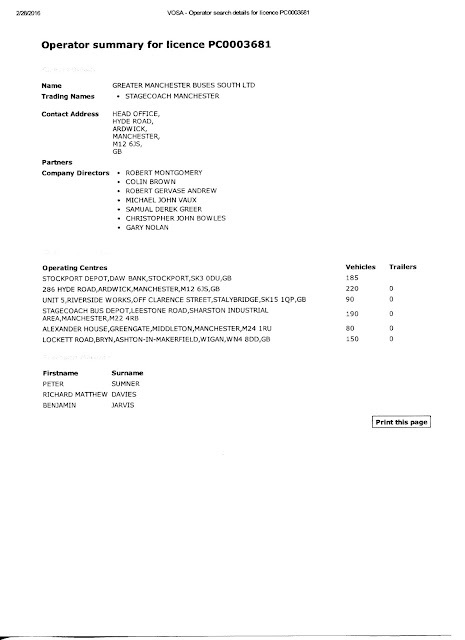 So could it be a pre-requisite of an IB buy out - no one has mentioned Rotala - that a link to Essex is established so IB's area isn't as restricted? I'm told people from Clacton have been sniffing around IB, no idea which operator but it would make sense if the IB operatig area could link up with an already existing area. It will be fascinating to see how things pan out over the year. Obviously as soon as I hear of anything else I'll publish it. Exciting New Decker For Anglian! That made you sit up and take notice didn't it! Of course it's not an exciting new decker for Anglian. 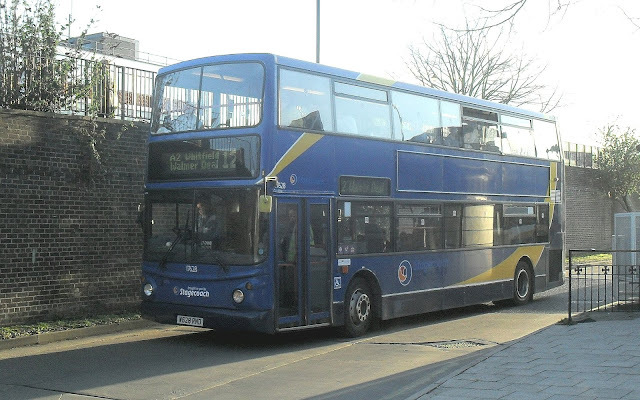 However in their quest to build a fleet made up of other Go-Ahead subsidiaries rejects I am grateful to one of my blogging buddies for informing me that on top of Konect's Solo 901 and Hedingham returning Trident 712 to Beccles, Anglian have now taken Konect's withdrawn ex London Central Volvo B7tl Gemini 513 LB02 YXE on a permanent basis. Makes you wonder what's next for the company that is clearly in a very sorry state. The Only Way Is Loooong! Saturday was not the first time I have travelled down to Kent by bus. It is, however, the first time I have travelled down to Kent by bus in mid February. It will also probably be the last time I travel down to Kent by bus in mid February. I don't suffer from travel fatigue. It's not a good thing for a bus driver or railway guard to suffer from but yesterday wiped me out.. The first 75% went vey well though. schedule wise at least I dragged Jackie the wonderful Loes Link driver out of her bed early on a Saturday morning to take me to Framlingham, where my early morning fragility was sorely tested by Galloway's Solo SR with minimal seat padding YJ14 BGE. Nothing wrong with the bus, and it was warm but those seats are ridiculously hard. One of my favourite routes is the 93 from Ipswich to Colchester. right through Constable country and you can see into some wonderful gardens. If you have a double decker. I didn't. Carters only have one single decker in the fleet now, a perfectly acceptable MCV Evolution that was comfortable if chilly, but no good whatsoever for looking into gardens! Carters MCV Evolution AY60 BVD sandwiched between 2 perfect garden voyeurism buses! On arrival at Colchester I was in need of a decker fix. Normally I catch the 71 to Chelmsford as it's quicker, and the 70 used to survive on a diet of Presidents. But the 71 is operated by single deckers, and since Braintree depot closed to become an outstation the 70 has been operated by ex Norwich B7tl ALX400's. Sure enough waiting on the stand at Colchester was 32478 AU53 HJO still showing signs of its former 61/62 university branding. It was a good journey if again rather cold. I was not looking forward to the next bit. I have mentioned before I am not a fan of the Volvo 7600. They vibrate badly, half the seats are uncomfortable and the electric motor is a gimick and nothing more. They do look good though! I had time to get a spot of lunch and let 2 go, hoping against hope a B7rle would be on the route but alas no. So a pretty unpleasant couple of hours ensued on the journey to Lakeside. After bumping into an ex Konect driver now working for Ensignbus and having a natter it was time to catch Ensignbus' X80 across the Dartford Bridge to Bluewater. It is always pot luck what you get on there so a B5lLH Gemini2 was very acceptable. Ensignbus Volvo B5LH EU62 BVD seen at Bluewater. I was expecting one of Arriva's usual B7tl's on the 700 to Medway but got a surprise to see a 101 Platinum branded E400 waiting. I have to say Platinum isn't up to much. Certainly not a patch on Stagecoach Gold and no improvement on First Excel. However the E400 gave a fairly decent ride. But it was at this point my troubles really started. I'm struggling to think why there is a shopping frenzy at the moment but half of the South East decided to go shopping in Bluewater yesterday. Not only that but they all decided to leave just before my 700 did causing absolute log jam. This meant we were 25 mins late getting to Medway and I missed my final connection. Arriva Platinum E400 YY14 WFX at Bluewater. As I had well over an hour to wait before my final bus I decided to get a taxi the last couple of miles. However it would appear taxi companies in Kent can't find bus shelters on main roads so I ended up having to get the bus anyway. I will not mention the operator of this final service as it appears they don't like being talked about or having pics of their buses published. But I would like to mention to the manager of said operator that instead on insisting perfectly reasonable posts that revealed nothing not in the public domain are taken down, you should pay attention to the sort of people you have driving your buses. The bloke driving yesterday greeted me with the sort of scowl I haven't seen in ages, as if stopping to pick me up was a personal insult, and we then had the following conversation. Me: Hello mate, does this bus go round the village? Driver : I don't know - does it? Me: Well I hoped you would be able to tell me. Driver: This isn't my usual route. As it turns out he should have gone round the village. He didn't. Presumably it said on his duty card if he should or sholdn't. I assume he just didn't want to. That is a tendered route. It is not what I either wanted or needed after 10 hours of travelling in the cold and wet. Very poor indeed. Think I might get the train home when the time comes. It has been a fairly quiet start to the new year with just the latest service cuts by Anglian, fare rises farce across Go-Ahead and a few new second hand vehicles floating around to rave about. So today when First gave the green light to announce their latest venture competing with the floundering Angian Bus it was seized upon with an almost pirhana like fervour among the enthusiast media. 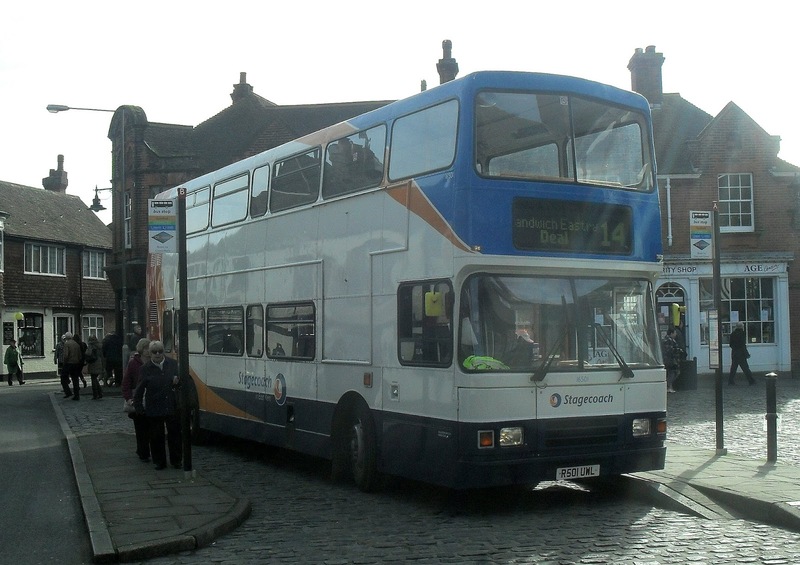 From April 4th First are starting a new Service 40 from Norwich to Poringland via Framingham Earl. It will be known as the Charcoal Line. That's not quite technically accurate as really it should be called the RAF Blue Line as I'll explain. 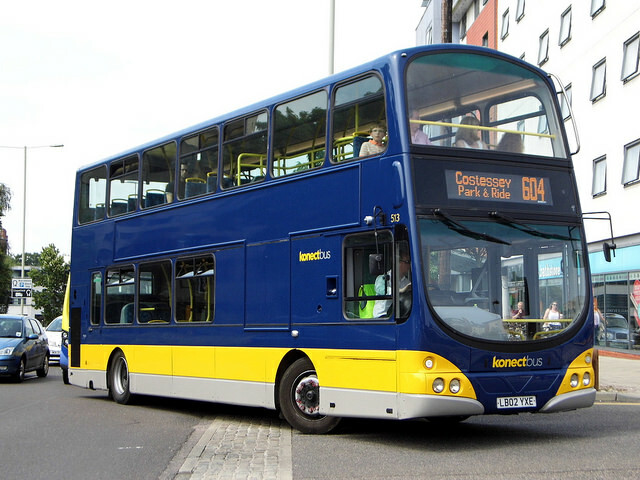 Due to Suffolk Council reducing payments on Concessionary passes even further it was decided that First's service 53 from Ipswich to Chantry should be scrapped. Don't be surprised to see the bus wars in Ipswich scaled down considerably by both sides in the coming months as traditional operating territories are ressurected. However this releases 3 Enviro200's that are used on the route. It is these vehicles that will be used on the 40, staying in Ipswich Grey, which is officially RAF Blue, but is now Charcoal! First have a good record taking on Anglian over the last couple of years. Mind you so might the 3rd Lowestoft Brownies if they put their mind to it, such has been the staggering arrogance and mismanagement at Anglian. 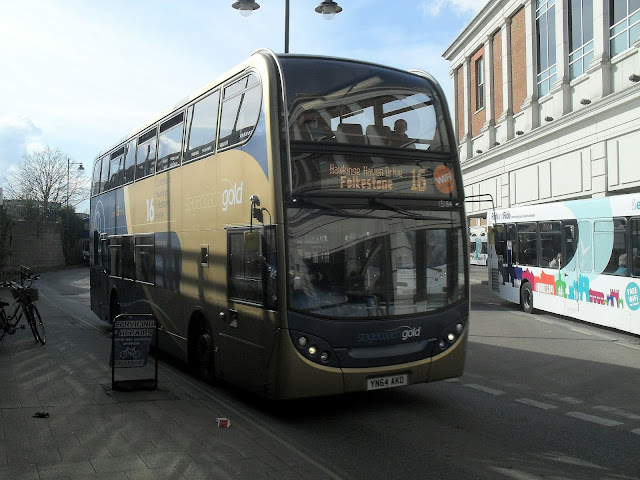 First easily saw off the challenge of the 164 between Saxmundham and Ipswich in 2013, the 99 in Kessingland has forced the withdrawal of the 62 and reduction of the 61 to half hourly. The X1 has swatted Anglian's 7 away like a fly, and now they are attacking Anglian's main source of revenue, the Poringland area. And they have found an attractive option for the good people of Poringland, who at the moment have the choice of the 87 or (X)88. The 87 goes a long way round via Stoke Holy Cross and Trowse. The X88 goes a quicker way but is normally pretty full by time it reaches Poringland meaning customers have to stand or squash up. The 88 again goes a longer way round on most journeys via Arminghall and Trowse. First's new 40 will run every 30 mins from Poringland to Norwich the same way as the X88, so it will be a fast service to Norwich which starts at Poringland meaning seats available. Good thinking. Obviously First have yet to announce full details but I fully expect financial incentives to lure passengers over as well. I'm not surprised by this. I'm just surprised it has taken so long. I know that there has been a lot of dissatisfaction in the Poringland area recently, and on Feb 22nd when the latest Anglian service "revisions" come in there will be even less fast journeys to Poringland especially in the evening peak. It will be very interesting to see how late in the evening the 40 runs and if there is going to be a Sunday service. I will update when I know the details. In other news the tenders for Community Transport in Suffolk have been announced, with the new contracts starting in June. I'm pleased my local operator has retained the contract, and it looks like business as usual. Again I have to see the fine print and digest any implications but I'm glad the jobs of the drivers I rely on so much, and the excellent and friendly girls on the phones have been preserved. Sorry for lack of posts at the moment - I'm back down in Kent at the weekend for quite a few days but hopefuly after memorial services etc have been held life can start to return to normal. However rest assured if anything important happens it will be reported here!